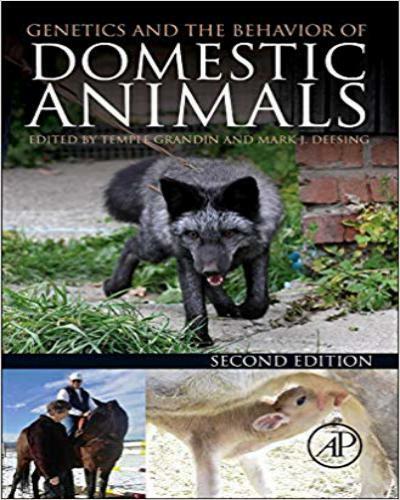 Genetics and the Behavior of Domestic Animals, In light of the ongoing debate on ‘nature versus nurture’ as determinants of behavior, it is somewhat surprising that this is the first book devoted to the role genetics plays in domestic animal behavior. This topic has not previously been given the in-depth treatment it receives here. Editor Grandin’s stated objective is ‘to illustrate that principles discovered by behavioral genetics researchers have practical applications in agricultural and companion animals.’ Of particular interest is the final chapter, ‘Genetics and Animal Welfare,’ which examines the often damaging effects of our efforts to select for certain traits and suggests criteria for determining the ethical limit for genetic selection. A fine work, highly readable and well documented. Extensive bibiographies. Recommended for all academic libraries. The purpose of this book is to bridge the gap between the field of behavior genetics and the research on behavior published in the animal science and veterinary literature. Fifteen years have passed since the first edition of this book was published. In that time considerable advances have been made in the study of the genetics and behavior. The second edition contains the addition of three new chapters and updates on the original chapters. Behavior genetics is a wide field and an integrated science. Understanding the relative influence of nature (genetics) and nurture (environment) in the development of behavior is the focus of behavioral geneticists. Basic genetic mechanisms producing changes in appearance and behavior of animals are described and key principles are explained in order to make it easier for the non-geneticist to read and understand the latest papers.